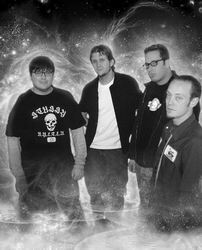 Jet Black Joy (1999-present) is a Thrash Metal band from Denver, Colorado, USA. n a time when musicians were dropping their guitars in favor of synthesizers and turntables, Jet Black Joy stepped in by late 1999 to fill the void. Using a Motorhead vocal range, heavy deep guitar, and influenced by the likes of Van Halen, AC/DC and Kiss, their music consisted of a hybrid of '70's and '90's hard rock raunch with socially aware lyrics. Featuring the membership of Byron Black (drums), Jimmy Jet (vocals), Nuclear J. (ex-Flannel; bass) and Biggie Joy (ex-Flannel; guitar) they got to work right away. OriginallyBlack and Jet each played in separate outfits; Jet, for his part, was already establishing a musical recording career with the single, Indifference, on the German label 'We've Had Enough Records'. He then joined forces with Commander Adama (of Agression) to release a full-length, Negative Man, on Canadian indie label 'Amp Records', and a 7 inch Schooch Pooch's The Landonnas on 'Rum Dummy Records'. With such a career, it was a given that he would be called upon to front a band like Jet Black Joy soon after. J and Joy, for their parts, were writing music for their start-up act Flannel, and recruited the services of Black and Jet to form Jet Black Joy in 1999 with the intent of creating socially aware and hard rocking tunes for their debut self-titled demo in 2001.